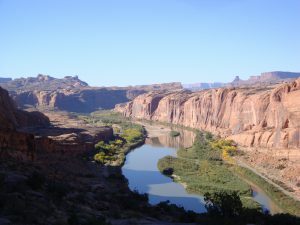 In the lowest and most arid parts of the Colorado River basin, moisture from the ground rises into the atmosphere before condensing rapidly to form frequent and sudden thunderstorms. These storms, which typically control the flow of runoff, provide irrigation for river-bank plants, supplement water supplies, and affect the chance that the river will flood, are crucial to the region’s water environment. 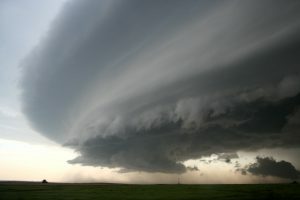 While researchers have speculated about the ways in which climate change might affect the frequency and intensity of rainstorms, few models exist to explore how such shifts might affect thunderstorms. That’s why hydrologists from the University of California (Santa Barbara) Earth Research Institute developed the STORM data visualization tool. The STORM tool, which creators Michael Singer and Katerina Michaelides call a “rainstorm generator,” enables scientists to explore the details of rainfall quantity and location on a minute-to-minute basis across multiple decades. Though developed using data from a single dryland drainage basin, the creators say the tool can be deployed to study precipitation patterns in any watershed throughout the world. When applied to watersheds with robust historical rainfall data, the STORM tool can analyze how climate change already has affected rainfall patterns in these sensitive regions. Researchers then can simulate these trends to get a clearer picture of how climate change might affect factors like flooding, storm intensity, runoff volume, and flow patterns. Early results from the STORM tool have challenged previous notions of how rainfall should react to a warming atmosphere. Applying the model to the Walnut Gulch Experimental Watershed in Arizona, for which decades of detailed rainfall information exist, Singer and Michaelides found that thunderstorms are becoming more frequent, but that they deliver increasingly smaller rainfall volumes to the watershed. With lower-intensity rainfall should come less surface runoff. Runoff projections from the STORM tool for the Walnut Gulch Watershed have supported that hypothesis, Singer said. The researchers intend to turn the STORM tool loose on other thunderstorm-prone watersheds to better understand the possibilities under different climate-change scenarios. Initial findings were published last month in the journal Environmental Research Letters.